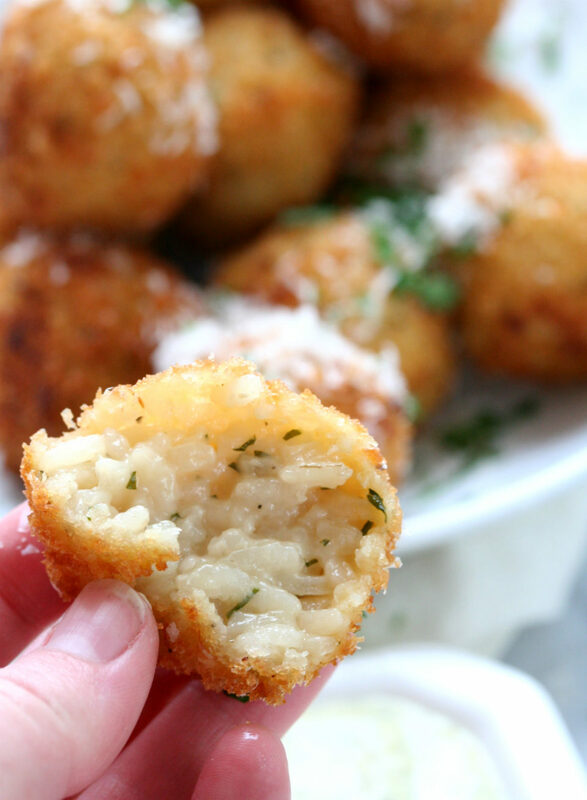 Arancini are rice balls that are stuffed and deep fried. Typically made with arborio rice that is often found in risotto. 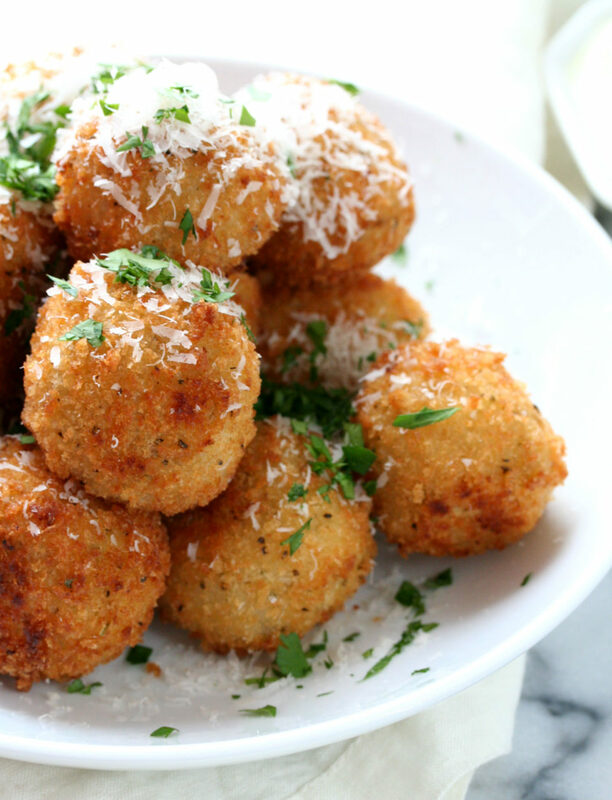 Arancini is one of those decadent appetizers I always order out at restaurants until I realized how simple it was to make at home. And so fun to serve for a crowd. I love making a big batch and freezing until my next gathering. A little something special not served at the average dinner party. That’s what I love about these, they’re bite sized and impressive. The champagne gives it a little zip and the blend of fontina and mozzarella cheese gives it a nutty bite. I serve these with aioli dipping sauces. For a quick cheater aioli; mix together 1/2 cup mayonnaise, 1 tablespoon lemon juice, and 2 tablespoons pre-made pesto. Super easy and again impressive. Your friends will think you hired a caterer! Wine Pairing Recommendation: French Sparkling! Serve with marinara or aioli. For a quick cheater aioli; mix together 1/2 cup mayonnaise, 1 tablespoon lemon juice, and 2 tablespoons pre-made pesto. Step 1 Bring the stock and 1/4 teaspoon kosher salt to a boil in a medium saucepan over medium-high heat. Stir in the rice, reduce the heat to low and simmer until tender, about 20 minutes. At this point add in the champagne and stir until liquid is completely absorbed. Spread rice on a parchment-lined baking sheet and let cool completely. Step 2 Mix together fontina, mozzarella, and parsley in a bowl. Step 3 Beat the eggs in a shallow pan. Place flour in a separate pan and panko in a separate pan. Shape the rice into even 2 tablespoon size balls, it’ll make about 16-18 balls. Press your thumb into the center of each rice ball and stuff with cheese mixture and pinch the rice around the filling to enclose. 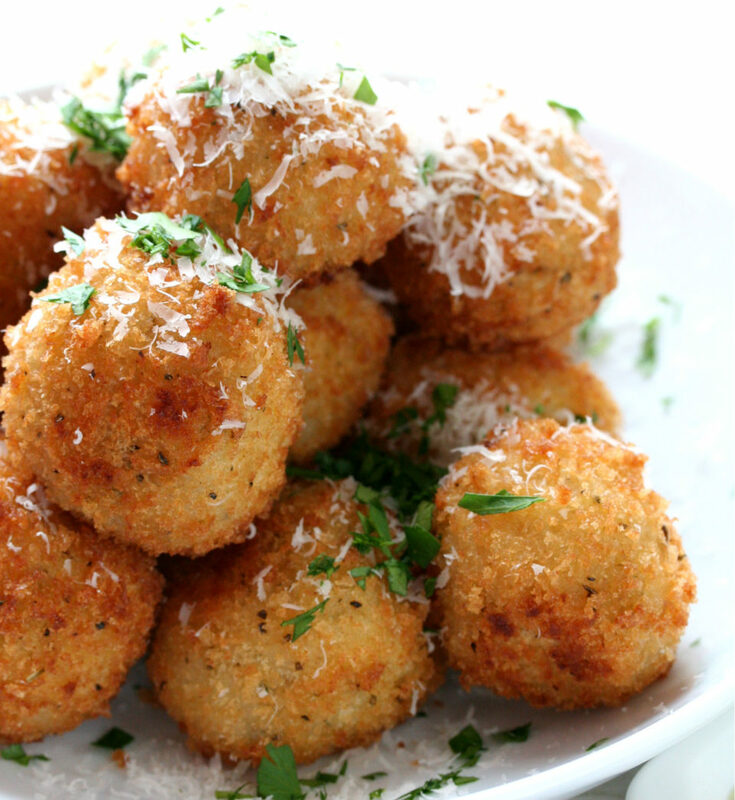 Roll the balls in flour, then dip in the egg mixture and roll in the panko. Place on a parchment-lined baking sheet. Cover with plastic wrap and refrigerate, for at least 1 hour. Step 4 Heat 1/2 inch canola oil in a large heavy bottomed pot or pan, I used my cast iron. Heat over medium heat until a deep-fry thermometer comes to 350 degrees F.
Step 5 Working in batches, fry the rice balls, turning, until golden brown on all sides, about 4 minutes. Remove with a slotted spoon, drain on paper towels, and season with a sprinkle of kosher salt. Serve immediately and enjoy!